The new Messages for web feature will allow users to send and receive messages from their computer, similar to what WhatsApp for Web offers. 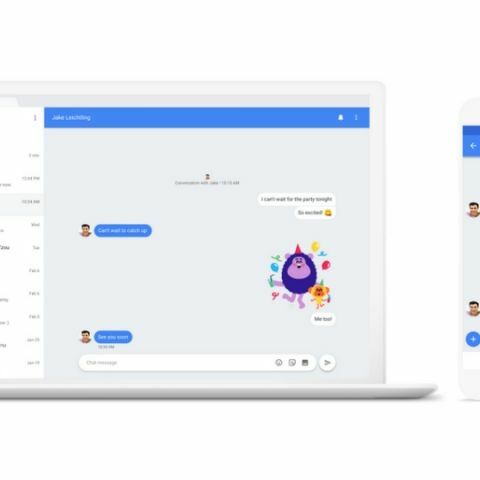 Google has rolled out some new improvements to the native Android Messaging client, as a part of which it now gets a web interface. Similar to WhatsApp for Web and the web client for Allo, a user will be able to send and receive messages from the Messages for web app, from their computer. The new feature will be rolled out to users over the next week and Google says that it is one of the top-requested features from users. In order to make use of the new feature, the user needs to navigate to Messages and tap on the three-dot menu. Then select Messages for web option and scan the QR code on the website here. This process is similar to how one would set-up WhatsApp for Web on their device. Google has also announced some more features for the Messages app, alongside the new web interface. One will be able to search and send GIFs over messages and by tapping on the ‘+’ button that appears on the left side of the compose bar. The company is also bringing its Smart Reply feature to the app, which uses Machine Learning and contextual awareness to formulate replies that are eerily on point. This feature is intended to save a user’s time and will be available for English currently and will be rolled out for other languages over time. Same as WhatsApp, users will be able to see a link preview when they receive a URL. There will also be a convenient functionality that allows users to tap and copy One-Time-Passwords (OTP) when the notification shows up. This should bring some respite to privacy conscious users who don’t want to give notification access to an app just for reading an OTP. The new features come soon after the news that Google is shifting its focus from Allo to Messages. And the addition of new features can be considered just a start if Google is thinking of taking on WhatsApp, iMessages and other chat apps. With Rich Communication Services (RCS), the Message app can support everything a modern day chat app comes with and on top of that, it could be pre-installed on every Android smartphone, if it’s included in Google’s suite of essential apps (GApps). This will definitely give Messages app an edge over the competition, except for the downside that the communications over RCS are not end-to-end encrypted.